The Indian Space Research Organization (ISRO), which has created history of 105 satellites simultaneously in February, has been prepared for another big experiment. 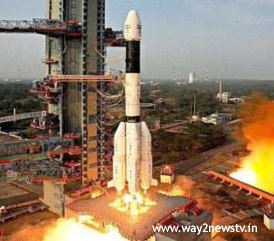 It will send 28 overseas satellites into space with three home-made convoys by PSLV-Sea 40. Sriharikota Satish Dhawan in Nellore district will be in the first launch platform at the Center Center Shar Center at 9.29 am on Friday. Countdown began on Thursday morning at 5.29 am. It is expected to be launched at 9.29 pm on Friday morning after 28 hours. The liquid fuel was supplied to two to four phase motors on the racket by remote. One and three phase engines operate with solid fuel. Scientists have emerged at the Mission Stage Review meeting in Sharj on Wednesday and scientists at the Launch Authorship Board meeting under Shrir Kunhikrishnan. ISRO sends satellite to 42nd space by PSLV. Kartosat-2 is the main mile of the 31 satellites launched by ISRO. These satellites were designed to analyze groundwater conditions and provide information to the Land Control Center. Cartosat was first demonstrated on January 10, 2007. The latest launch includes satellites from six countries such as USA, France, Finland, Korea and Canada, along with microphones and nano satellites. The Cartosat 2 satellite specifically studies the Earth's atmosphere. The IRNSS-1H satellite rocket launched by ISRO on August 31 last failed in four phases. The experiment was unsuccessful when the final stage did not separate from the radiation rocket. In February last year, ISRO, which has sent a series of 104 satellites to various countries, has received praise from the world countries. India has been choosing India as an alternative to sending cheap satellites into space.